German sausages are delicious and the source of much national pride. In fact, many beloved recipes from certain areas are considered closely guarded secrets. 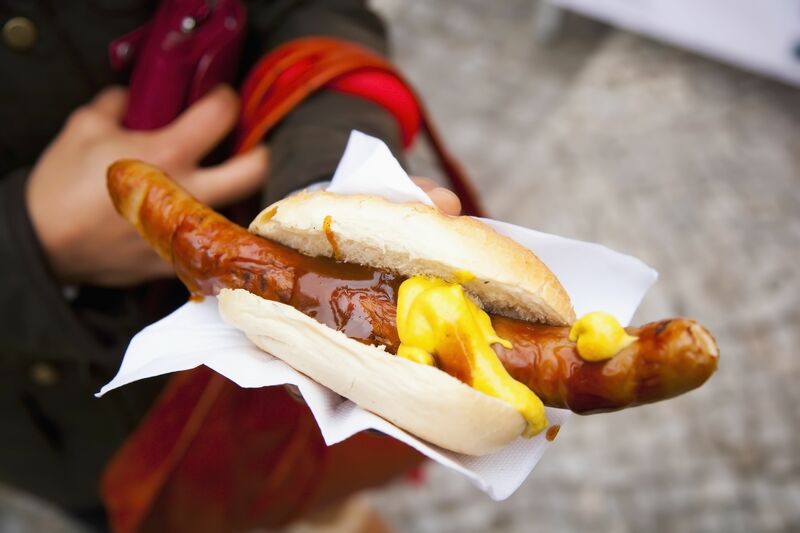 Here, we let you in on 12 of the most common German sausages. Thüringer Rostbratwurst features spices like marjoram and caraway, sometimes garlic. The sausage, which are large and usually grilled, is formed using casings from pig intestines. Blutwurst, or blood sausage, is made with congealed pig or cow blood and contains fillers like meat, fat, bread or oatmeal. It is sliced and eaten cold on bread. Bockwurst originated in Frankfurt and is made from veal with some pork or other meats and flavored with salt, pepper and paprika. It is boiled and eaten with Bock beer and mustard. It looks like a curved hot dog. Short and stubby Knackwurst, or Knockwurst, sausages are often all-beef and flavored with garlic. They are sometimes smoked and then served traditionally with sauerkraut and potato salad. 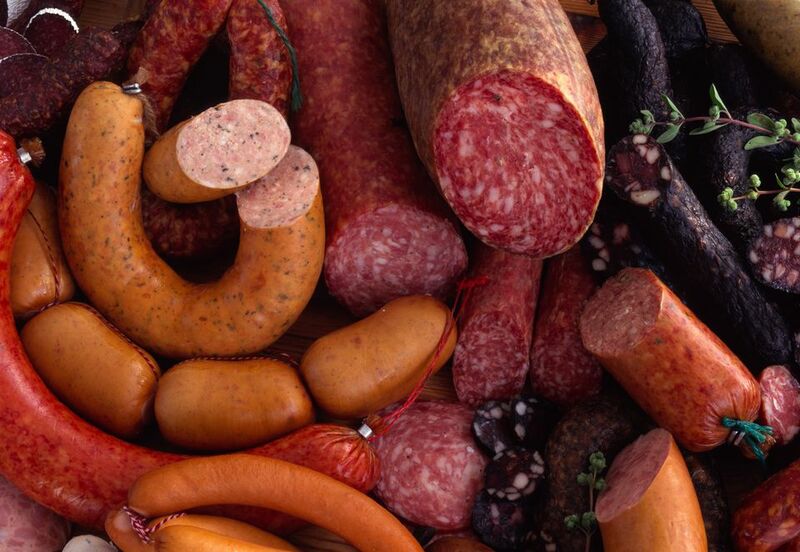 Landjäger is a type of dried sausage made from beef, pork, lard, sugar and spices. It is air dried and resembles a small salami. It does not require refrigeration and can be eaten cold or boiled. Leberwurst, or Liverwurst, is usually made from pork with some pork liver and flavored in various ways. It is spreadable. Kalbsleberwurst – veal liverwurst is made from veal and pork liver. Braunschweiger – spreadable, smoked pork liver sausage. Leberkäse (literally "liver cheese") from Bavaria is a type of sausage that does not contain cheese or liver. It is similar to a pink meatloaf with very finely minced corned beef, pork and onions. It is spiced with marjoram and baked in a bread pan until a golden crust develops. Served freshly baked in 1/2 inch slices, many people also enjoy eating it cold. Teewurst is an air-dried or raw sausage (like salami and Landjägerwurst) made from pork, bacon and beef. After being smoked over beechwood, it then undergoes a fermentation much like yogurt to help preserve it. Teewurst got its name in 1874 from its inventor, Karoline Ulrike Rudolph, and was meant to be eaten at tea-time on open-faced sandwiches. Known for its mild and slightly sour flavor, the recipe is kept secret. Gelbwurst means yellow sausage and takes its name from the saffron-colored casings used to make it. Gelbwurst is mildly spiced with lemon, mace, ginger and cardamon. While it used to contain brain, it doesn’t today. It can be made from pork, bacon, beef or chicken. Weiβwurst (white sausage) is a traditional sausage of Southern Germany made with veal and bacon and flavored with parsley, onion, lemon and cardamom. This sausage is boiled and eaten without the skin. Because it traditionally contains no preservatives, weiβwurst is usually eaten before noon with sweet mustard, beer and soft pretzels.